Most of our classes are walk-in workshops, suitable for all ages! This means you do not need an appointment (although we do appreciate the heads up!). Classes that require a reservation are specified as such. It takes about 1.5 to 3 hours depending upon the size of piece you make. We also offer custom sizes to suit your design needs as long as we have advance notice. This is a GREAT IDEA for parties and fundraisers! One project per person except when working on a very large project or when parents are helping small children. If you have 4 or more people in your group, or if it is a rainy day in summer please call to schedule in advance. Otherwise, for walk-ins, stop by any day we are open between 10am-3pm. Flip Flop -$35, Cupcake -$35, Surfboard -$45, Star -$35, Heart -$45, Turtle -$40, Wave -$45, Sand Dollar -$40, Ice Cream Cone -$35, Butterfly -$50, Sailboat -$65, Dragonfly -$50, Lighthouse -$65, Mermaid -$65, Dolphin -$65, Shark -$65, Seahorse -$75, Whale -$75, Dinosaur -$75, Elephant -$75, Anchor $65, Crab -$45, Fish -$60, Pineapple $45. Cost includes tools, materials, and instruction. This is a walk-in class available for all ages. Mosaic projects are make-and-take! Make an awesome piece of mosaic art and take it home with you the same day! Make your own 18¨ x 20¨ STUNNINGLY BEAUTIFUL mirror in this festive environment. Professional tools, materials, and expert instructions provided. Take your mirror home at the end of class. This is great for a girls activity night, bachelorette, date nights, birthdays and more! Come here for class then go out to dinner after…Good times! Every Friday, 5-8 PM - Pre-registration required. 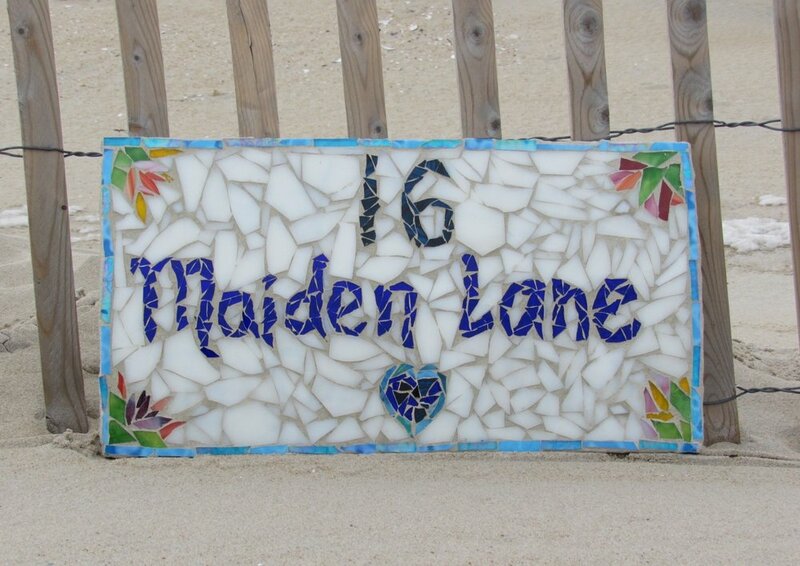 Make your own custom house number, date plaque & more! Weather ready for your outside space! Mosaic is the process of cutting glass into pieces, glueing them to a surface, and then grouting the finished piece to fill in all the tiny gaps between each piece. This is an ancient and beautiful art form, a class we are very proud to offer! Mosaic classes are make-and-take! Each project takes 1-3 hours, we grout it for you, and you can take it home when you leave. 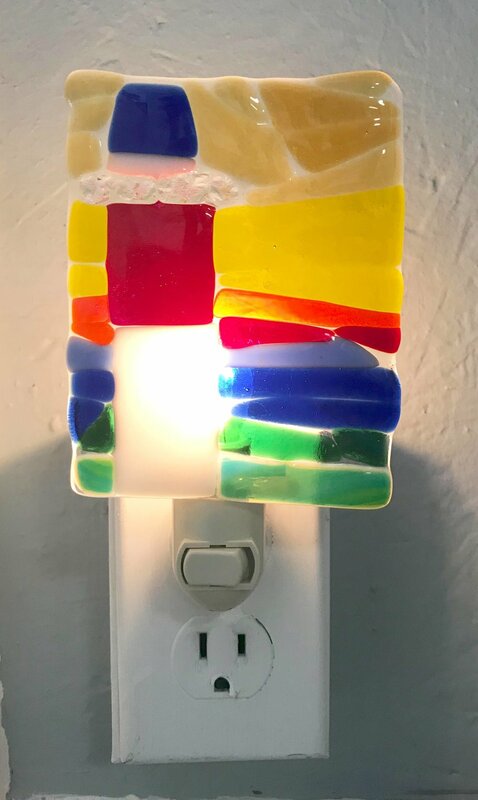 Find your way through the darkness with your very own brilliant fused glass night light. This has to fire overnight in our kiln so pick up is a couple days later OR shipping is available for an additional fee. Price is $35 per piece per person. This is a walk-in class. Cost includes tools, materials, and instruction. Available for all ages. Price is per person unless helping a small child. Sunshine and happiness will flow through your sun catcher and into your home like a warm summer sunrise. Class takes 1.5-2 hours. We offer two sizes: 8" or 10" round. Piece will be ready for pickup a couple days later OR shipping is available for an additional fee. 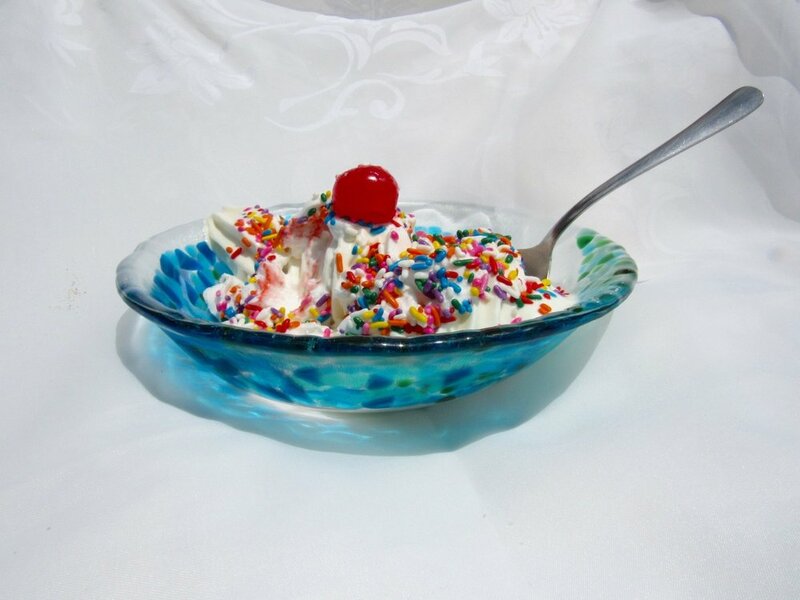 Create an 8" fused glass bowl with your own personal flair! Pick up your bowl 3-4 days later after it is fired twice in our kiln. If you can’t get in to pick up your bowl, we can ship to you for an additional fee. Food tastes better in a bowlful of LOVE! Great for soup, ice cream, or just to display in your home! Class take approximately 1 - 3 hours. Price is $75 per person. This is a walk-in class. Cost includes tools, materials, and instruction. Available for all ages. Price is per person unless helping a small child. You will love making these unique and colorful focal pendant beads that all your friends and family will want! Make up to 9 fused glass beads. Pick up 1-2 days later. This is a walk-in class. Cost includes tools, materials, and instruction. Available for all ages. Price is per person unless helping a small child. Have you seen our school of fish at Sco-Jos? Wouldn’t it be fun to make your own? Class takes about 1 hour and you make one large colorful fused glass fish. Pick up 3 days later after we fire your art in our kiln or we can ship for a nominal fee. Cost is $175 per person per fish. Class is offered all day on Wednesdays. Celebrate your inner ELF!! - Come by SwellColors in Surf City this holiday season and make three fused glass ornaments to give as gifts or to put on your tree. What a fun way to spend time and create something truly unique. Our Holiday Ornaments class runs from Black Friday through Christmas/New Year’s. The class takes about an hour, then we fire the glass in our kiln. You can pick up a day or two later. Suitable for all ages...This is a walk in class, so no appointment necessary. This class costs $50 per person and you make three ornaments OR $35 for an individual ornament. Thank you for shopping small and supporting your local artisans. This class is only offered around the holidays (Nov-Dec), with no pre-registration required. Fusing is the process of taking different colors of compatible glass and melting them together at high temperatures overnight in a kiln. Each fusing project is unique and always a special surprise the next morning when we take it out of our kiln. All class projects are fired on premises and can be picked up a few days after your class or we can ship your projects to you for a nominal fee. Come try fusing glass today! Have you often wondered what to do with the beautiful treasures you find at the beach? Now you can learn how to drill holes in sea glass and make all sorts of things with your new skill. Use your new skill to create your very own sea glass jewelry, mobiles, and more..
Bring 3-5 pieces of sea glass or use some of our own tumbled sea glass to practice. Cost starts at $50 per person and takes approximately one hour. Cost increases depending upon size and complexity. In all our jewelry making classes, we teach you how to make your own custom-designed, handmade jewelry. We can teach you some basics in bead-making, sea glass jewelry, and metal stamping. You’ll be off crafting your own creations before you know it- jewelry making is so much fun! This is a great beginner class for anyone who is interested in how stained glass is made. We guide you through the steps using our professional tools and materials to make beautiful sun-catchers. Make 4 heart sun-catchers or 3 stars. Cost is $95 per person. Pre-registration required. Ages 15 and up. Learn the process of making a stained glass window using our professional tools, materials and guidance. This is a great way to try this ancient craft and create your own panel to take home at the end of the day. 10am-5pm. Make a 12”x12” or 11”x13” window. Cost is $350 per person. Pre-registration required. Stained glass is the process of creating a puzzle-like design in glass. We use what is called the Tiffany method. Each piece is cut by hand, grinded around the outside edge, wrapped in copper foil, soldering together with a soldering iron, and finally cleaned and finished. Stained glass is one of our most advanced classes available, and you must be at least 15 to participate in these classes.